In 2013, Google rolled out an update for Gmail which completely changed email marketing forever – Tabbed Inbox. Primary Tab: People consider this tab as their main inbox. All emails from your contacts and other non-classified email goes here. Social Tab: This tab houses all the emails and notifications from social media websites. Promotions Tab: All the automated marketing emails and newsletters with heavy HTML land in this tab. Updates Tab: All notifications related to confirmations, bills, bank statements etc. make their way to this tab. Forums Tab: Includes emails from online discussion boards and communities. While the Tabbed Inbox update was well received by Gmail users, email marketers had a different story to tell. Most of the email marketers were in a frenzy as they saw a decline in their campaign performance due to emails landing in Gmail’s Promotions tab instead of the Primary tab. 1. How many Gmail users have enabled the Tabbed Inbox? 2. How many Gmail users have their Promotions Tab enabled? 3. How often do Gmail users check their Promotions Tab? Compared to almost 100% adoption after its launch, the Tabbed Inbox is now used by only 1 in 3 Gmail users (33%). 60% of the users have their Promotions tab enabled, which is right behind the Social tab which has an adoption rate of 68.1%. Contrary to popular belief, 45.1% Gmail users check their Promotions tab at least once in a day. While the above data confirms the change in user perception towards Gmail’s Promotions tab, there are still many marketers who would want to avoid it, particularly while sending transactional emails. Are you one of them? Don’t worry we’re here to help you out. As marketers, most of us are used to maintaining subscriber lists and blasting emails to the entire list. Gmail is extremely sensitive to email blasts. It quickly tags them as promotional email or spam. Some email marketing apps have features that allow for the sending of emails in smaller bursts rather than all at once, but this is still not good enough. The alternative is to trigger individual emails to each member of your audience separately. For e.g. when they perform an action like subscribing to a newsletter, login to your app, or make a purchase. I know what you’re thinking — this is a transactional email – and not a marketing email. Right – that’s precisely the point. 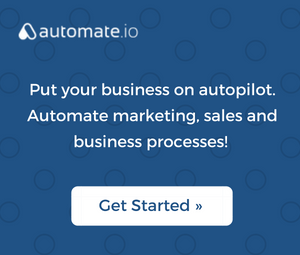 Action tip: How to send transactional marketing emails with Automate.io. You can setup trigger-action based automated emails for all possible customer events that happen in your marketing, sales or other apps. Facebook Lead Ads are a great way to increase marketing leads cost effectively. So if you have an ebook campaign, you can send a personalized email to every Facebook lead from Gmail by connecting it with Automate.io and the ebook will reach the user’s Gmail primary tab. If you’re confused as to why your emails are going to Gmail’s Promotions tab, this just might be the reason. There is no way your beautifully-designed HTML email can land in Gmail’s Primary tab. Based on your email source code, Gmail determines if it is sent by a human, or automated. Your email code should appear as if you’ve actually typed it in an email client and not designed in an email marketing app. Emails sent by an Email Service Provider like MailChimp, Aweber, ActiveCampaign are most likely to go in Gmail’s Promotions tab as majority of people use them to send marketing emails. A great way to do this is by sending plain text emails, or at least ‘light HTML’ emails. Light HTML is technically HTML (mime type), but the content is primarily text. No images, CSS, and minimal links. It’s important to keep the links to a bare minimum. Ideally not more than one or two. An example ‘light HTML’ email. This didn’t make it to Primary tab though. You should also take care to not mention or avoid the usage of Spam Trigger Keywords. These Spam Trigger Keywords are those keywords which are considered as spam under email marketing like Free money, Free offer, Get Paid, etc. You can refer to this list for more such keywords which need to be avoided. We all know how important it is to send our prospects a personalized email, but there’s more to it. A study mentions, “deep personalization” can drive as much as 17% more revenue from email campaigns. 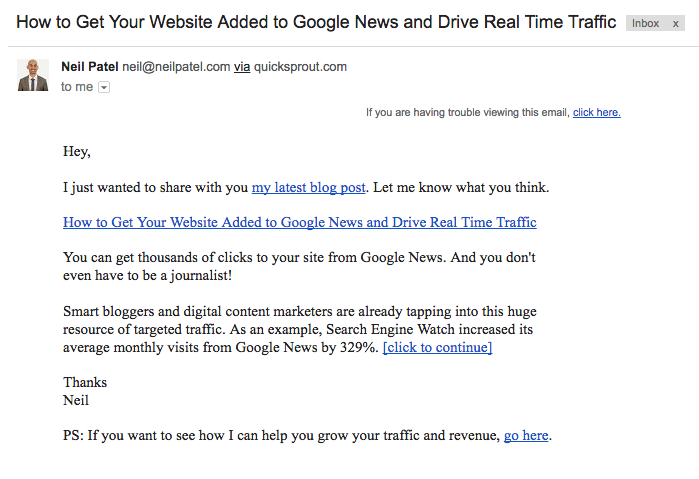 Personalize your email content for the users. This will not only help you in your pursuit to avoid Gmail Promotions tab but will also result in improved open and click rates. Add recipient name and any contextual data to subject line. Add content to the email body that is unique to the recipient. If you are sending a “transactional marketing” email, try adding information relevant to the transaction in the email. This way, each email that Gmail sees will have a fair amount of difference in content and hence it is less likely to be classified as promotional email. Action tip: How to send personalized transactional emails using Automate.io. Usecase: Let’s say when someone fills in a SurveyMonkey or a Typeform form on your website and you want to send an automated email via MailChimp or Gmail after 5 mins. Automate.io allows you to use the data filled in the form as drag-drop merge fields to personalize the email content. Add your email to their contacts list from the email menu option in Gmail – this will automatically put all your subsequent emails in Gmail’s Primary tab. Move the email manually from Gmail’s Promotions tab to Primary tab – when they do this, Gmail prompts them if all subsequent emails from the sender should be automatically moved to the Primary tab. There are tons of security checks done by Gmail before your email reaches your subscribers. Based on these checks it decides whether to send your email to the Primary tab, Promotions Tab, Updates Tab, in the spam folder or not deliver your email at all. One of the important factors that affects email deliverability is email authentication. Email authentication helps mail servers like Gmail verify that the email is being sent from the users at your company and that it hasn’t been changed along the way, thereby preventing email spoofing. DKIM: DomainKeys Identified Mail signature helps in verifying the ownership of an email message. SPF: Sender Policy Framework record specifies the domains that you can send emails from by verifying the sender’s IP address. DMARC: A DMARC record defines how your domain handles suspicious emails. It uses information from DKIM and SPF to verify the authenticity of emails. Here’s how you can set up email authentication if you’re a G Suite or a MailChimp user. Other factors that contribute to email deliverability are: Email content, list hygiene, spam complaints, previous engagement rates. Therefore, work on improving your email deliverability if you want your emails to land in Gmail’s Primary tab. This might seem like the hardest thing to do but it works like a charm. To make it easier, you can use the Mail Merge Google Sheets Add on or the GMass Chrome extension to send bulk emails from Gmail. The only thing to keep in mind here is Gmail’s Email Sending Limits, which is 500 emails/day for free accounts and 2000 emails/day for G Suite users. Sending via Gmail will also help in making the email appear non-robotic. Typically when you send emails from an email marketing software, with your email address as the From address, Gmail shows a ‘via’ source beside the sender’s email. This doesn’t happen when emails are sent directly from Gmail and hence, it appears more personalized. 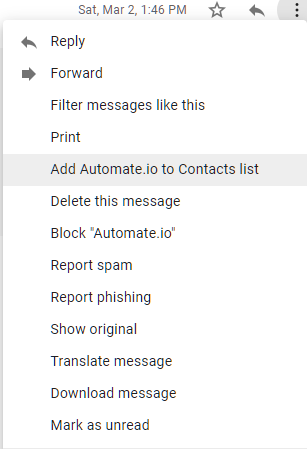 Action tip: How to send automated emails via Gmail using Automate.io. It’s straightforward. Add your Gmail account as an Action App and you can use it in an automation Bot with any Trigger App to send an email. Trigger App: The trigger app is used to define when your automation should start. E.g. On a new row in Google Sheets. Action App: The action app is used to define what happens in your automation. E.g. Email is sent via Gmail. Believe it or not but sometimes it is that simple. Your subscribers have opted-in to receive emails from you because they are interested in what you have to offer. If you just focus on creating high quality relevant content that will delight your subscribers, it will hardly matter if your email lands in Gmail’s Promotions tab or Primary. Because your subscribers will be actively on the lookout for your next email and uncover it even from the depths of Gmail’s Promotions tab. Live by these words and work towards delighting your customers every single day (or in this case your subscribers) and sales will follow, trust me. Use separate authenticated sender addresses for sending promotional and transactional emails. This way you’re guiding Gmail to land emails from specific address to the appropriate tab. If you want to test which Gmail tab your email will go to, use this tool by Litmus. You can A/B test to understand which elements are truly affecting where your email will land in Gmail, fix it and then send an email to your subscribers. Email marketing is becoming more and more competitive by the day. The key to getting results is to keep your subscribers engaged by sending them high value relevant content, being timely and personal in your communication. I hope the above tips will be helpful in improving your ROI from email marketing and most importantly building deeper relationships with your customers. P.S. With Gmail now launching annotations in Promotions tab, do you as a marketer still want your emails to appear in the Primary tab instead of the Promotions tab? Let us know in the comments below. Editor’s note: This post was originally published on 19th March, 2017 and has been updated for freshness, accuracy and relevancy.